Before I get too wordy and approach the dreaded TL;DR territory, let's put this simply. Join our team, get/give donations, play games on Nov. 3rd, save kids' lives. It's that easy. Now for the more wordy version. 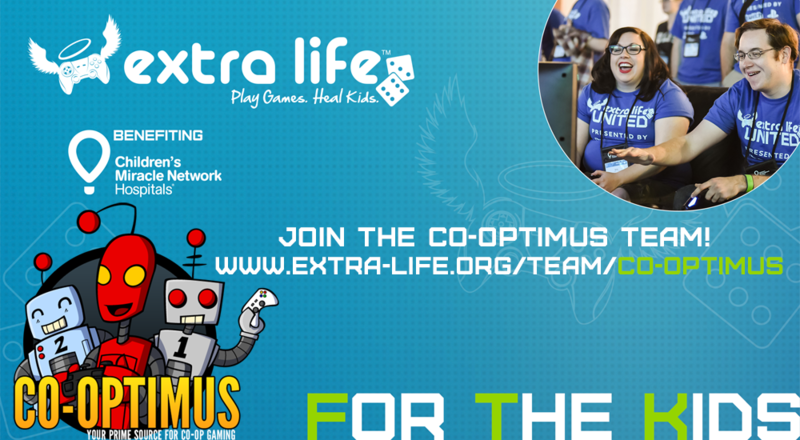 Extra Life is a charity led by a huge community of gamers who raise donations for sick and injured kids who are stuck in Children's Miracle Network Hospitals. That's right, when you pay for your Panda Express and the nice cashier asks you if you'd like to round up to support Children's Miracle Network Hospitals (and you say "heck yes! "), it's the same network of hospitals. By the way, if I don't hear that bell ding after you pay for your delicious Kung Pao chicken, I judge you. Everyone judges you. This is our 7th year participating in this amazing charity event, and we would love to have more members on our team. If you have it in your heart to help the less fortunate kids in the world, you should head over to our team page and join. As you're signing up, you may want to pony up the $19 to become a platinum member, which gives you access to all sorts of prizes (t-shirt, in-game goodies, gold/silver medal) as you hit fundraising milestones. You'll also have the opportunity to select which hospital will receive donations made from your page. You can pick your local CMN hospital, or any other hospital in the network. Then sit back and watch the donations roll in... Wait! No, don't do that. Tidy up your personal Extra Life profile page, then send your link to everyone in your contact list who has a pulse. Don't forget your mother; she raised you since you were a baby and is more likely to make a donation than anyone else you know. If you can't play games on November 3rd, the official "Game Day", no worries, you can play whenever you want for however long you want. Game Day has morphed into more of a celebration of our efforts, and it is certainly not a requirement to participate. The important part is pulling in those donations to help sick and injured kids! Please give it some thought, and consider joining our team. If gaming isn't really your thing but you'd still like to help, you can also make a donation right from our team page. Thanks in advance for all your efforts and donations! Page created in 0.6498 seconds.